We often think of needing to escape to a spa or a retreat centre to rejuvenate and unwind and tune-in, and although this is a great thing to do, what if you could create this same experience in your home? Intentional living is a creative process of aligning your home space with your spirit and soul. Essentially, you are creating a sanctuary for your soul. A place that you feel safe and supported so that you can fully recharge and be yourself. 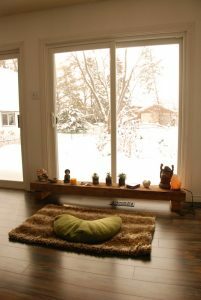 I recently completed the process of transforming my home into a sanctuary for my soul. It has been an incredible journey that has had a beautiful impact on all aspects of my life. Through this journey, I have become acutely aware of how our home environment impacts our emotional, mental and physical well-being. Before I transformed my home, I lived in a space that had dark walls, a living room that was centred around the television, and furniture consisting of mismatched hand-me-downs, creating an environment that was not inspiring or uplifting or supportive to my needs. Each one of us has unique needs in order to feel nourished and inspired by our home space. My sanctuary may look very different from yours, however, the stages of this transformational process are the same. The first stage is to get clear on your intentions of how you would like to live and to feel in your home. This is a good time to grab a pen and paper and write down all of the feelings that come to mind. Anything is possible, and all great things begin with a vision. Ask your soul what it needs in a home to feel safe and nourished. When I got quiet and asked my soul what it needed, I was amazed and saddened by how out of alignment my home was from my own needs. My soul did not feel at home here. It did not feel inspired by the décor or the use of each room. My soul wanted so much more. It wanted a space to dance in, a place dedicated as an altar for my daily spiritual practice, a space to commune with my fiancé and friends. It wanted me to read and write and create, rather than numb out to TV, and it wanted a light-filled, inspiring kitchen to create delicious food in. Once you have written your list, it is time to purge all that does not resonate with these intentions. This is the second stage. I personally love this stage as I feel a sense of lightness when I get rid of things that no longer resonate, or I no longer need. I feel it is really important to love everything that is in your home. Because every time you look at something it invokes a feeling or a thought, which affects you. A room must be cleared of old energy first, to invite in the new. You may end up living with an empty room for a while but it is far from empty; it is full of pure potential. Now you are ready for the third stage – it’s time to go shopping! Get clear on your intentions and vision and start with a focal point for each room. For example, in our living room, we had the intention of feeling cozy, warm, inspired and connected. 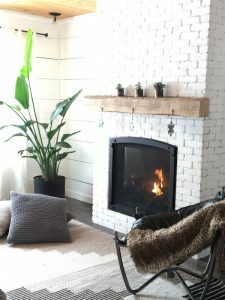 So we changed the focal point from the television to a beautiful gas fireplace surrounded by white brick and an aged piece of wood for the mantel. 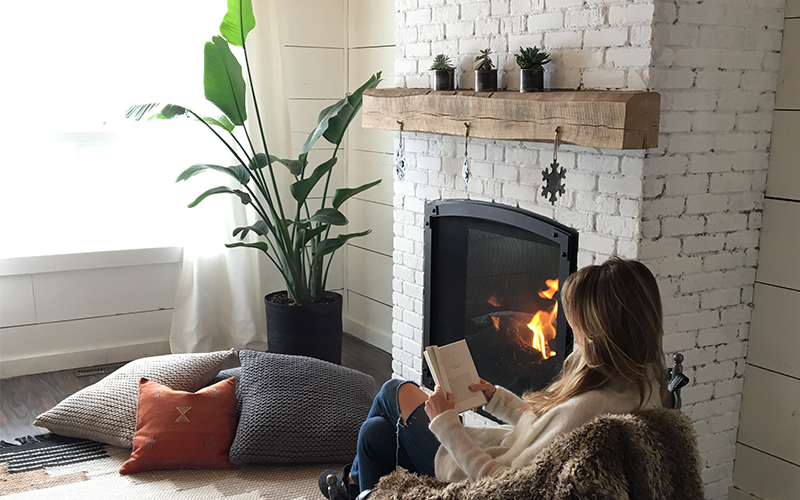 The fireplace brings in the cozy, warm sun element that we so miss in the winter months. We bought a deep plush couch and floor pillows so that we could lounge around, read and chat, and relax. We are inspired by nature, so we brought in beautiful tropical plants and gave them stunning plant holders which contribute to the beauty of the room. Plants are an incredible addition to any space as they are living beings who graciously clean the air and bring life into the home. This all happened over a course of months, and it taught me a great deal about patience and not rushing the process. I recommend focusing on one room at a time to make it feel manageable and rewarding. The final stage is to enjoy your new home space. I was blown away by the transformation visually and emotionally. My space gave off a completely different energy and vibration than before. My home is a reflection of all the things that matter to me. Every morning, I wake up and greet my home with so much love in my heart. Designer of intentional spaces, Katie is a powerful motivator and inspirational force, with an innate gift of elevating the energy of everyone she meets. 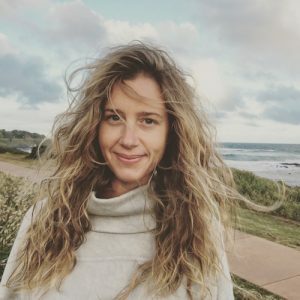 An expert in health and holistic nutrition, Katie supports her clients in nourishing their body and creating a soul sanctuary in their home space to achieve harmony and a solid foundation for a life that can thrive.